Where the new “Walkable City” by Jeff Speck talked about creating walkable streets, the classic Life Between Buildings, sees streets as one part of the public realm outdoors in between the buildings. Jahn Gehl’s Life Between Buildngs isn’t new at all. First published by the Danish designer in 1971, when stark modernist architecture and city planning were painfully fresh, but Scandinavia and other European areas were just starting to recover from the mistakes of car-centric design and building-centric architecture. 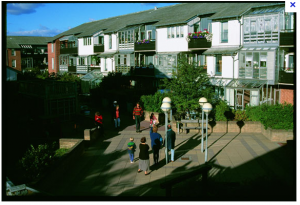 Cities for People, published nearly 30 years later in 2010, largely recaps Life Between Buildings, but adds some interesting material about new developments in the intervening decades. For Jan Gehl, walkability (and later on, bikeability) are important, but only a small fraction of what is needed to make a place livable, where people enjoy spending time out of doors, between buildings, and socializing with others. 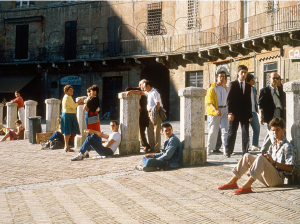 In cities following Jan Gehl’s practices, the success of a public place is assessed, not just by the number of people who travel through on foot or by bicycle, but the people who stand and sit a while to watch and socialize. Gehl shows how traditional cities, and new developments that are created with sensitivity to traditional principles, create spaces that respect people’s physical, sensory, and social capabilities. Places that are compact enough so that people can see and hear each other – people recognize each other from about 55-75 yards away, can detect emotion at 24-27 yards and can hold a conversation starting at about 7.5 yards. Places where people can casually observe the flow of passers by and social interaction. Where there are “soft edges” between private and public space, where people can interact. Where there are comfortable spots to stand and to sit, especially along the edges of a space. Buildings and public spaces that are designed to respect the local microclimate instead of creating wind tunnels or ovens. Growing up, I experienced some of the most notorious failures of mid-20th century public space. 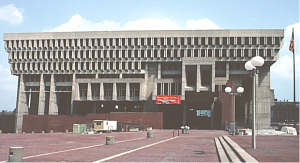 The desolate, wind-swept plaza in front of the well-loathed Brutalist monstrosity of Boston City Hall, and the various empty plazas in front of boxy towers in Center City Philadelphia seemed to indicate that plazas were bad ideas, and efforts to liven them up with goofy art were exercises in pretension; but it’s not so; well designed public places attract street life year-round, and not only in genial climates. Following the principles for successful outdoor places, including locations that may seem to a Californian to be uninhabitable 9 months out of the year. 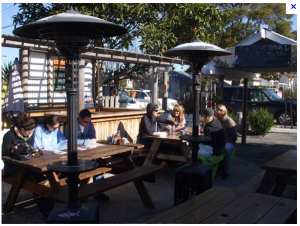 By designing a place well, and then including heat lamps, awnings, windscreens and blankets, places even in cold climates have people sitting outdoors nearly all year round. Gehl’s practice over several decades in Scandinavia and cities around the world has involved measuring social life in city spaces and showing it is possible to improve continuously with ongoing observation and refinement. 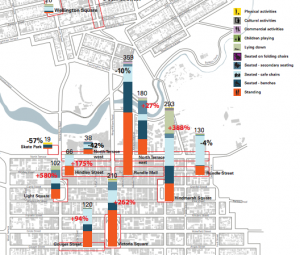 The image below shows a chart of “staying” activities in downtown Adelaide including standing, sitting, children playing, cultural activities, commercial activities, and more. California design practice values open green space, and does a good job with private spaces for outdoor eating and drinking, but don’t as often create successful social public spaces. One challenge may be caused by our society’s failure to care for and accommodate the mentally ill and very poor; public spaces and public seating are often heavily used by people who are delusional and aggressive, the spaces then fail to serve other needs. There are also design flaws. Palo Alto’s Lytton Plaza had a recent redesign to make it more social, but made the classic mistake of sprinkling tables throughout the plaza, rather than focusing seating around the edges; the seating in the middle fills up last. Gehl’s observations and insights explain why the row house front porches were so appealing. 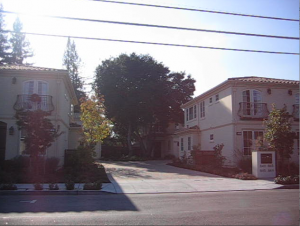 His insights explain what is disturbing about new potentially friendly little townhouse complexes in my neighborhood that are built around a stark, empty, superwide driveway for the big firetrucks, rather than porch/garden/courtyard. What is missing in the new townhouses on my block, with narrow steps heading to the front door, but no good place to stand and chat with a neighbor. What is rather creepy about the forlorn tables hidden in a corner or of the Safeway parking lot, where an employee might grab a furtive break, or a visitor might rapidly eat a sandwich before escaping back to her car. Gehl’s Cities for People is a newer take on the same subject. Much of the book rehashes the earlier material close to verbatim. Cycling is a major addition; in the decades since the earlier book, Copenhagen emerged as a world leader in cycling for transportation, with bike commute mode share of 37%. Cities for People also has a handy glossary of techniques to create people-friendly places, and a few tasty charts from Gehl’s studies of street life in Scandinavia, documented in the out-of-print Public Spaces Public Life. Gehl’s perspective, that outdoor spaces between buildings can be enjoyable for everyday social life in most climates, is richer and more about human senses, psychology and sociology, than Speck’s excellent but more utilitarian book. Speck focuses on how our streets fail to enable necessary activities (things we have to do); Gehl spends even more time on how to make outdoor spaces successful for optional activities (things we want to do) and social activities (interactions with others). Get one or the other of Gehl’s books (but not both) for a broader perspective about what outdoor urban spaces can be, and for insights on how spaces can be improved. I recently read two books: one new, and one (and a half) classic, about the practices of making streets walkable and places friendly for people. Growing up, I was lucky to take walkable streets and livable neighborhoods for granted. When I was 13, my family moved about a mile from a neighborhood of modest brick rowhouses within city limits to the first suburban neighborhood over the city boundary, with mostly single family homes. The modest rowhouses had front steps next to a front porch which in the summer could be sheltered by a canvas awning. In the evening and on weekends, neighbors would stand out on front steps and chat. But when new neighbors moved next door with surly dispositions and noisy dogs, my parents moved a mile away to the suburbs. The suburban neighborhood was an postwar suburb near a streetcar line with relatively narrow somewhat hilly streets. A library and convenience drugstore were a half mile away. My family belonged to a Jewish community where members lived within walking distance of a synagogue, and there were strong customs of walking social visits on the Sabbath and holidays. Walking was built into the culture. The suburban neighborhood was greener and the houses were a little bigger. But I still missed the experience of people standing out on the front porch chitchatting on summer evening, and kids playing street hockey and stickball in the back alley. So what is it that makes places walkable and livable? Walkable City, a new book by designer and planner Jeff Speck describes the practices that can restore walkability in places that were designed or transformed to promote the elusive goal of the free flow of automobiles. Walkable City is an immensely quotable and highly readable summary of the benefits of walkability, and the ways to make places walkable. Useful. In order for people to walk, they need to be able to get to places they want to go – places like retail stores, schools, and parks. This means having useful destinations walking distance from each other. This requires fixing conventional mid-20th century zoning codes that create single use districts that make it impossible to walk from your house or work to a store or restaurant, because everyday activities are too far away from each other. Interesting. In order for people to be willing to walk, the street needs to have interesting detail at eye level. How far people are willing to walk is not a factor of distance, but the appeal of the environment (see Steve Mouzon’s classic article on Walk Appeal. Blank walls and parking lots facing the street make for tedious and unsafe walking environments. The classic suburban-style design approach is to insulate the blank walls and parking lots with setbacks and landscaping, but it doesn’t work; the route is tedious, and people won’t walk far. Safe and comfortable. Yes, streets also matter for walkability, and the book describes the elements of walkable street designs. Walkability is helped by short blocks and connections that let people get to where they’re going. Underutilized suburban areas can be retrofit to recut a street grid over time. (The book says more about block size than about connections that can open walking and biking shortcuts through cul de sacs and parking lots). Walkability also is helped by limiting excess curb cuts where incoming and outgoing cars conflict with pedestrians. Safe walking is hindered by streets where cars go too fast because there are too many car lanes and the lanes are too wide. “Lane diets” can increase vehicle capacity by converting a 4-lane road to 2 vehicle lanes plus a center turn lane. Vehicle capacity goes up because the turn lane takes turning vehicles out of the way of through travellers; speeds go down, and crashes go down. Wide lane widths, intended to make driving safer, actually encourage speeding and reduces safety. Cities that converted one way streets back to 2-way have found that it slows cars down increases walking and economic vitality. The conversion to one-way streets in the 60s and 70s was intended to help the city by speeding car travel, but it turned out that surface freeways hurt downtowns and neighborhoods. These changes can swing the balance back from prioritizing cars passing through, to better support for pedestrians, cyclists, and drivers taking local trips. These changes can be contentious, since people have gotten used to treating local routes like freeways. But the impacts are severe, cutting neighborhoods from places to go, and making it unpleasant to shop or do ordinary activities outside of a car. One issue that Speck does not address robustly is the problem with the standard functional classification, which classifies streets based on their role in moving vehicles and local access, but does not take into account the land use around the street. Following standard street classifications, high-volume streets that run through areas with lots of houses, schools, or stores and serve many people taking short local trips, are designed as if the main goal was moving cars across town, regardless of the people who want to walk or bike for their local trips, or need to cross the street to get to their destination. The evolution of functional classification is a work in progress; there are some case studies and new work in the field, but not definitive new answers. Speck directs the harshest criticism in the book on traffic engineering practices that continue to encourage building more and more road capacity in an attempt to alleviate congestion. Research over time shows that building roads creates demand that fills the capacity; a 2004 meta-analysis shows that on average, a 10% increase in lane miles induces an immediate 4% increase in vehicle miles travelled, which climbs to 10% in a few years. In addition to the “how” of creating walkable streets, the book provides a thorough but lively explanation of the reasons why: the economic benefits for walkable areas, the environmental and health benefits. The book also is a great primer for related practices that help create walkable communities; including effective transit and parking. I agreed with most of the book, but had a few quibbles here and there. Speck rightly says that jurisdictions need to do “triage” and focus on improving walkability in some places before others. But his emphasis on “downtowns” I think misses some important dynamics. The concept of a “downtown” implies a metropolitan region with a single center. The San Francisco Bay Area has multiple large and small cities arrayed around a large body of water. Many large metropolitan areas have multiple “centers.” Traditional pre-car big cities are composed of multiple neighborhoods that have local shopping and schools and businesses. I am still learning and could change my mind about this, but I am not convinced that there is an ideal pattern of a central skyscraper metropolis surrounded by concentric circles decreasingly dense areas (following the new urbanist transect model). There are metropolitan areas in Europe in which multiple cities of various sizes are connected by superb transit service. The Washington DC metro area has created walkable towns along its transit corridors. Sprawling San Jose and the classically sprawled LA area are seeking to retrofit along boulevard corridors and neighborhood centers. Triage by “focusing on success” leaves out substantial opportunities for retrofits in underutilized or failing areas. These places are promising not because they are successful, but because they are in such poor shape that jurisdictions are willing to change their practices to revitalize the area. Failed malls and other underutilized sprawl areas can add denser mixed use development and a street grid, with less argument from people who want to preserve things as they are. The “focus on success” principle sounds disturbingly like helping the rich get richer. By contrast, some of the bus rapid transit proposals in the South Bay, similar to BRT programs worldwide, travel through low-income areas with a lot of people who don’t have cars, and who walk today on streets that are appallingly unsafe for pedestrians. Some of the pedestrian-friendly boulevards cited in Allan Jacobs’ classic boulevard book are not in wealthy areas. The advantages of walkability shouldn’t just be for the wealthy. Finally, using a Complete Streets policy, cities can leverage their routine repaving projects to incorporate low-cost traffic calming improvements involving street restriping at low to no additional additional cost, and street crossing improvements that save lives at minimal additional cost. Many areas are low density now, and are going to remain so for the forseeable future, and serve people who prefer low density. Even there, modest incremental investments in street paint and arterial crossings can save lives over the next few decades. Another critique is that the book could be somewhat be better on cycling. The section on cycling focuses too much on where to put bike lanes, and what sort of bike lanes, and not enough on how to overcome barriers to practical bike routes. Fundamentally, I think Speck underestimates the value of cycling in helping places recover from car-dependent development patterns. In moderately dense areas that have a lot of useful trip distances in the 1-5 mile range, cycling could easily account for a large share of trips for many people. Today, Copenhagen with 37% mode share is an outlier; but with good infrastructure that could be much more common. In Palo Alto, 10% of residents use a bike as a primary commute mode *today*. If the ratio of commuters to regular bike users is similar to San Francisco (where 3.5% commute by bike and 17% take a bike trip weekly), this suggests that over 40% of Palo Altans regularly use a bike for transportation. Speck criticizes cycling advocacy as a “special interest” for a small minority, but the numbers are mainstream in some places in the US already. “Walkable City” is a really solid book about how to create walkable, livable communities. If you want to get up to speed on the topic, read this book. If you know a lot, you’ll skim some, but still get something out of the book. And if you know people who *should* know this material, give this book as a gift. Next up, a review of “Life Between Buildings” which sees walkability as only a small part of creating a thriving environment in streets and other public spaces.